Pip-Forex Broker Review - Is it ideal for beginners? If you are new to Forex trading then Pip-Forex is ideally suited to you thanks to it's easy-to-use nature and very simple layout. The aim of Pip-Forex seems to be to make it as easy as possible for someone who has never traded Forex. They give you a free practice account and free beginners guide when you sign-up so you can start learning the basics of trade immediately. The one thing that lets it down, and the reason I have only given Pip-Forex a 4 star rating, is the fact you need a minimum of $200 to start trading. If this isn't a problem to you then great, its a good platform. If you wanted to start trading with less then you may find Easy-Forex a better option. What I like about this platform is it's approach to removing all the technical jargon so often seen in Forex. As a new trader you just don't need all of that because it slows you down. Therefore, Pip-Forex presents everything in simple, easy-to-understand language so you can start trading properly, fast! They actually say you can start trading in just 7 minutes because of the simplicity of their platform and to be honest I do agree - it really is that easy. 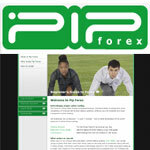 Pip-Forex offer a great platform orientated around the new trader. The simplicity of the platform make it ideal if you have never traded before or struggle to understand some of the terms usually used in Forex. Whilst I think both Easy-Forex and Forex Yard are better all-round platforms, Pip-Forex is still an excellent choice as your first broker.